The latest light gun arrives on the PlayStation 3 that also comes with Namco's Time Crisis 4 and once again offers gamers another realistic first person shooter experience that is extremely reminiscent of those old arcade shooter games. Although there were some issues with accuracy in relation to the previous GunCon controller from Sony ,this current incarnation has been considerably improved in that department. This latest incarnation comes with two infrared sensors that are placed on top of your TV which conveniently plugs into your PlayStation 3 USB port. Once this has been connected, you then need to plug the GunCon 3 intro another USB port and the installation is complete. 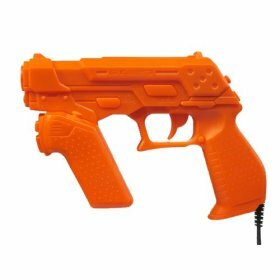 The GunCon 3 looks like a futuristic gun, however comes in a bright orange colour which is a little unrealistic but from a "safety" and societal viewpoint, one can see why this done. The unit also comes with a trigger, two buttons on the side of the barrel and another two on the back. Best of all, it also comes with an analog stick which can also be used to navigate through the gaming environments. All in all, quite a well designed controller that is also comfortable to use. Before starting Time Crisis 4, the GunCon 3 must be configured and this is achieved by shooting the gun at certain parts of the screen in order to assist with gaming accuracy, once this is achieved, the player is ready to engage. For those unaware of the Time Crisis series, the game revolves around operatives Giorgio Bruno and Evan Bernard who have been ordered to investigate and prevent a top secret weapon from falling into the hands of international terrorists! The story may be 80's but it's classic Namco at its best! 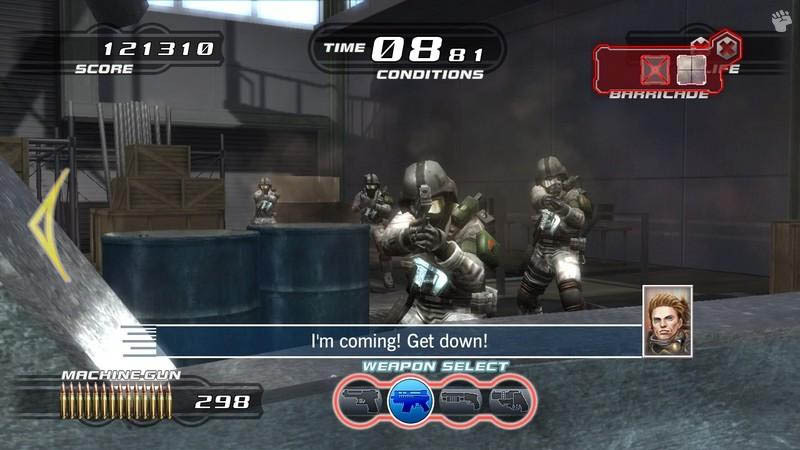 Namco continue the over the top action of the game with larger than life characters and missions with that extremely cheesy voice acting that has become a staple of the franchise. Unfortunately for our heroes, a new biological weapon has been launched call the "terror bite" which is a deadly swarm of bugs and once again it is up to the heroes to defeat this terrorist organisation and prevent the "terror bite" from decimating the world. 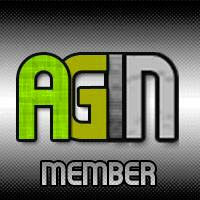 Next Generation Guncon – The most advanced Guncon ever, redesigned specifically to enhance next-gen gameplay. New dual analog stick design- Change camera angles, switch out weapons and control your character’s movement, including crouching and jumping. FPS mode – Exclusive to the console version and entirely new to the Time Crisis universe, roam freely as a new, console exclusive playable character, and experience FPS style gameplay in 5 new stages. Full Mission – Play through a combination of original stages and brand new FPS stages. Arcade - Experience arcade action in your very own living room! Crisis Missions - The popular Crisis Missions are back and more exciting than ever, now with new tactical missions! Destroy biological weapons and complete other objectives requiring the utmost in stealth and precision. Mini Games - Test your sharp shooting skills and complete your objective within seconds, or go head-to-head with a friend in a variety of challenging mini games. Upgraded Arsenal – In addition to your standard weapons assortment, such as handguns and shotguns, upgrade to grenade launchers and mounted machine guns (FPS mode only) to increase your lethal arsenal. Also features unlockable console exclusive bonus weapons. Select your weapon and be prepared to assault enemies from every direction. 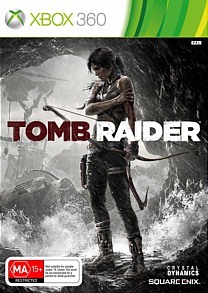 The game contains two interested gameplay modes that include arcade and mission which will have most gamers finish this title in record time. As a solo game, the title is quite impressive, albeit short, however as a multiplayer experience, the game is definitely entertaining and assists in the longevity of the title. 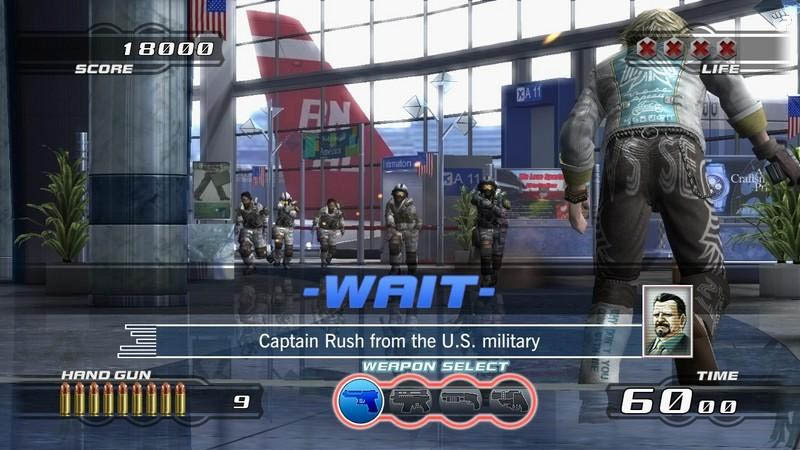 In its essence, Time Crisis 4 is your standard first person shooter light gun game where the player must use the GunCon 3 to eliminate their enemies. You can also the gaming environment to maximise your cover as you fight a variety of enemies and bosses in order to successfully complete the title. Once you have exhausted your ammunition, you need to seek cover which automatically reloads or you need to find ammunition that is littered throughout the gaming environment. 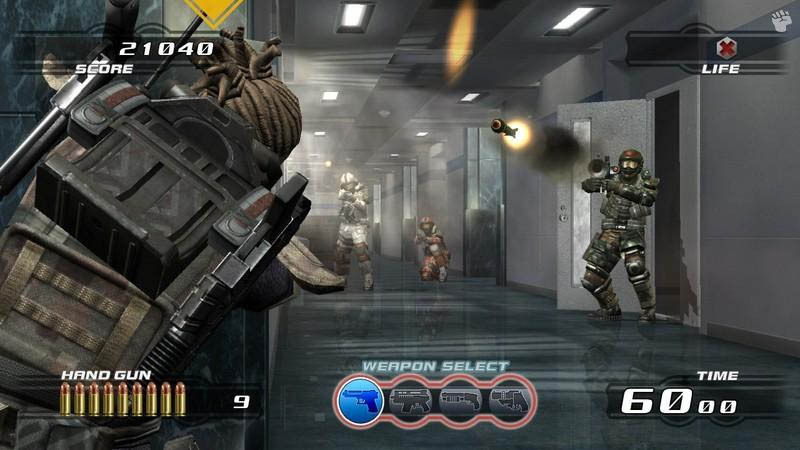 The game also features a variety of different weapons that include machine guns and shotguns for some interesting gameplay but nothing is more satisfying than using the machine gun, however the ammunition is used quite fast though. You always have bullets for your handgun. As you progress through the game, you are given various navigation options of which way you want your character to move through the level and this is usually an option to go either left or right but does assist to the replay value. Although the graphics are quite impressive, the level designs are somewhat limiting as the player is still governed by the GunCon 3 limitations but nevertheless, it is still an entertaining journey. Graphically, the title is quite impressive on the PlayStation 3 and has this traditional arcade feel to it with high resolution textures. The characters are well animated as are the cutscenes with a variety of special effects and lighting effects but at the end of the day, it doesn't give the gaming world a true technological boost. It seems like Namco have gone down the path of if it aint broke, then don't fix it and this is what Time Crisis 4 is all about. The music suits the genre perfectly as does the cheesy voice acting and what would a Namco game be without the over the top voices? 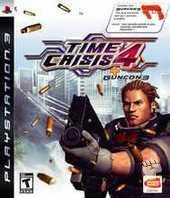 In conclusion, Time Crisis 4 is a fun game, however the title itself is rather short. The GunCon 3 is a decent piece of equipment and I hope that there will be more games available that use this technology as the accuracy is quite impressive. It may seem like yesterday and quite limiting when compared to first person shooters of today but it's just damn good fun. 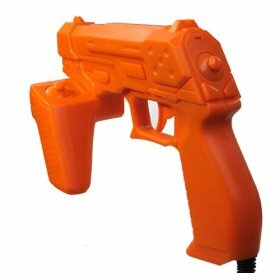 Compared to the Wii gun? GunCon 3 wins! Oustanding!